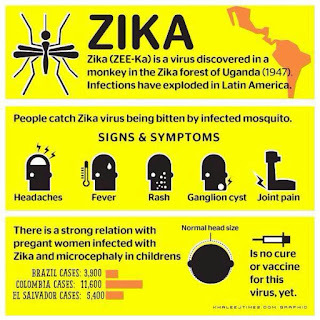 Zika virus, a member of flaviviridae, was first identified in 1947 in Uganda in rhesus monkeys and subsequently in humans in 1952. It is an emerging mosquito-borne virus and its outbreaks have been reported in Africa, the Americas, Asia and the Pacific. Following an incubation period that is likely to be a few days, the symptoms include fever, skin rashes, conjunctivitis, muscle and joint pain, malaise, and headache. These symptoms are usually mild and last for 2-7 days. During large outbreaks in French Polynesia and Brazil in 2013 and 2015 respectively, potential neurological and auto-immune complications of Zika virus disease were reported. Recently in Brazil, an increase in Zika virus infections in the general public as well as an increase in babies born with microcephaly in northeast Brazil were observed. There have been increasing body of evidence about the link between Zika virus and microcephaly. Zika virus is transmitted to people through the bite of an infected mosquito from theAedes genus, mainly Aedes aegypti in tropical regions. This is the same mosquito that transmits dengue, chikungunya and yellow fever. Zika virus disease outbreaks were reported for the first time from the Pacific in 2007 and 2013 (Yap and French Polynesia, respectively), and in 2015 from the Americas (Brazil and Colombia) and Africa (Cape Verde). In addition, more than 13 countries in the Americas have reported sporadic Zika virus infections indicating rapid geographic expansion of Zika virus. A case of sexual transmission of Zika virus is reported recently from Texas, US. Zika virus is diagnosed through PCR (polymerase chain reaction) and virus isolation from blood samples. Diagnosis by serology can be difficult as the virus can cross-react with other flaviviruses such as dengue, West Nile and yellow fever. Mosquitoes and their breeding sites pose a significant risk factor for Zika virus infection. Prevention and control relies on reducing mosquitoes through source reduction (removal and modification of breeding sites) and reducing contact between mosquitoes and people. Zika virus disease is usually relatively mild and requires no specific treatment. People sick with Zika virus should get plenty of rest, drink enough fluids, and treat pain and fever with common medicines. If symptoms worsen, they should seek medical care and advice. Currently, there is no vaccine available.